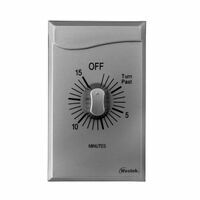 Intermatic Time Switch Tripper Set, ON/OFF, Suitable For Use With: T104, T102-20, T104-20, T100 and T700 Series Time Switches and Mechanisms, Black/Gray, 4 in Length X 1/2 in Width X 5 in Height Westek Mechanical Timer, Programmable, 125 V, 15 A, 60 Hz, 1875 W Power, 24 On-Off Cycles per Day Cycles, Light Indicator, Plug-In Mounting, 3.1 in Overall Height, 2.7 in Overall Width, 1.6 in Overall Depth, Plastic, White, UL Listed, 1-Outlet, For Indoor Applications Straight plug, converts one outlet into six with built-in circuit breaker switches to prevent overloads. Rated 15 amp, 125 volt, 1875 watts. UL listed. Carded. Straight plug, converts one outlet into six with built-in circuit breaker switches to prevent overloads. Rated 15 amp, 125 volt, 1875 watts. UL listed. Carded. 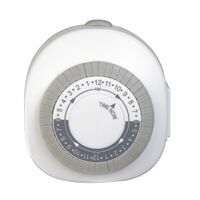 Westek Mechanical Timer, Programmable, 125 V, 15 A, 60 Hz, 1875 W Power, 24 On-Off Cycles per Day Cycles, Wall, Plug-In Mounting, 3 in Overall Height, 2.85 in Overall Width, 1.8 in Overall Depth, Plastic, White, UL Listed, 1-Outlet, Grounded Plug, For Indoor Applications Multiple daily programming, cycle repeats every 24 hours. Plugs directly into wall outlet. Up to 24 on/off settings per day. Instruction slot and manual override switch. Programmable in 30 minute intervals. Capacity 15 amp (1875 watts) resistive / 8 amp, 1000 watts tungsten / 5 amp ballast, 125 volt, 60 Hz. Pins stay in the timer, never get lost. CSA Certified C/US, CFL compatible. 2.5" depth x 5" width x 6.25" height, .22 lb. White with taupe silkscreen. 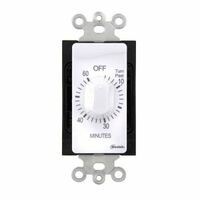 Westek Countdown Timer, Spring Wound, 125 V, 20 A, 2500 W, 2 hp Power, 1 Poles, Wire-In Mounting, 4.13 in Overall Height, 1-3/4 in Overall Width, 2.16 in Overall Depth, Plastic, White, UL Listed, For Indoor Applications Westek Countdown Timer, Spring Wound, 125 V, 20 A, 2500 W, 2 hp Power, 1 Poles, Wire-In Mounting, 4-1/2 in Overall Height, 2.76 in Overall Width, 2.16 in Overall Depth, Plastic, Stainless Steel, UL Listed, For Indoor Applications Pre-programmed settings, repeats weekly. Turns on and off twice a day at random times. Instruction slot and manual override switch. CSA Certified C/US, CFL compatible. White with taupe silkscreen. 2.5" depth x 5" width x 6.25" height, .20 lb. 15 amp (1875 watts) resistive / 8 amp, 1000 watts tungsten / 5 amp ballast, 125 volt, 60 Hz. With 2-conductor outlet and plug. Single outlet, 900 joule surge tap, white. Rated 15 amp, 125 volt and 1875 watts. Built-in circuit breaker to protect against overloads. Protected and grounded indicator lights. Tap surge 5-outlets, protected and grounded indicator lights, 2 wide-spaced outlets for transformer plug. Automates lamps, fans and other 3-prong appliances. 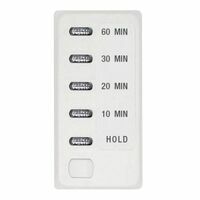 Up to 6 on/off settings per day, repeats weekly. Programmable in 2 hour intervals. 3-conductor outlet and plug. Pins cannot be removed or lost. Instruction slot and manual override switch. CSA Certified C/US, CFL compatible. White with taupe silkscreen. 2.5" depth x 5" width x 6.25" height, .24 pounds, 15 amp (1875 watts) resistive / 8 amp, 1000 watts tungsten / 5 amp ballast, 125 volt, 60 Hz. With 3-conductor outlet and plug. Reverse ground pin placement, when mounted to wall, unit accepts most right angle and transformer plugs. 24 hr repeat cycle programming, turns outlets on and off same time daily. 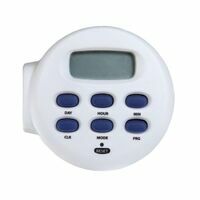 Programmable in 30 minute time intervals, provides 48 setting options in 24 hr period. Push down pins, extremely easy to operate. Angled housing design makes unit easy to read and program. 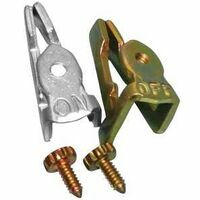 Two 3 prong grounded outlets, use with indoor or outdoor devices requiring a grounded connection, control 2 devices from one outlet. On/off top mount override switch to easily bypass programming. Compatible with CFL, LED, fluorescent and incandescent bulbs. 15A resistive, 10A tungsten, 1/2 horsepower. USB charger, folding plug, Compact design perfect for travel. 20-percent faster USB charging. Compact design perfect for travel, Red and green charging indicator lights. Slim style surge tap. 20-percent faster charging. 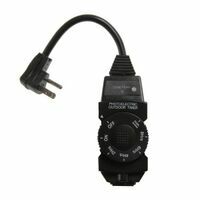 Westek Countdown Timer, Electronic, 120 V, 15 A, 1800 W Power, 10, 20, 30, 60 min Time Setting, Digital Display, LED Indicator, Wire-In Mounting, 4.06 in Overall Height, 1-3/4 in Overall Width, 1.63 in Overall Depth, Plastic, White, UL Listed, For Indoor Applications Thermoplastic high-impact strip converts single outlet to multiple outlets. Rated 15 amp, 125 volt and 1875 watts. Circuit breaker with reset feature shuts power off if overloaded. UL listed. 14/3 SJT 3' cord. Power strip plugs into existing outlets with no hard-wiring, 8' cord, right angle plug, safety covers, built-in circuit breaker. Rated 15 amp, 125 volt, 1875 watts. UL listed. Carded. 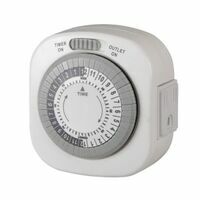 Westek Mechanical Timer, Programmable, 125 V, 15 A, 60 Hz, 1875 W, 1/2 hp Power, 24 On-Off Cycles per Day Cycles, Light Indicator, Wall Mounting, 6 in Cord Length, 4.8 in Overall Height, 3.35 in Overall Width, 1.6 in Overall Depth, Plastic, Black, UL Listed, 1-Outlet, For Outdoor Controlling Holiday, Lawn and Garden Lighting Westek Daily Timer, Self-Adjusting, 120 V, 8.3 A, 60 Hz, 1000 W Power, Plug-In Mounting, 4.9 in Overall Height, 2-1/2 in Overall Width, 2 in Overall Depth, Plastic, Black, 1-Outlet, For Controlling Holiday, Decorative or Accent Lighting 6 outlet surge protector 2pk. Protected red LED indicator shows surge protection is functioning. Lighted on/off switch. Size: 1.38" D X 6.5" W X 11.7" H.